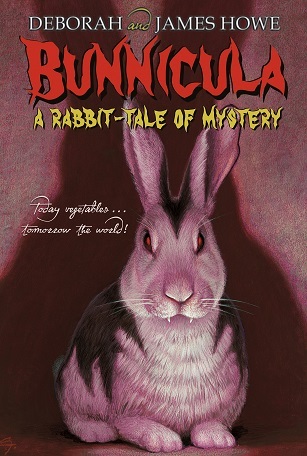 The Bunnicula series were my wife’s favorite childhood books. She’s very excited to finally have a child old enough to share this series of books with her. It tells the story of the Monroe family adopting a very strange bunny named Bunnicula. Good natured but slow-witted Harold the Dog (the narrator) and snobby and well-read Chester the Cat, a very humorous duo, notice something strange about Bunnicula who arrives at the same time that odd things start occurring at the Monroe household. The two investigate the strange bunny, who, SPOILER ALERT, turns out to be a vegetarian vampire bunny who sneaks out of his cage at night to drink the juices of all the fruits and vegetables in the kitchen. Harold and Chester remain suspicious of Bunnicula until something happens in which Bunnicula saves the day and shows himself to be a great addition to the Monroe family. A fun read for Halloween or any time, with lots of books in the series to keep an excited young reader engaged for a long time. This sounds great! I never picked this up, but now the whole family wants to read it! Thanks! Oh good! You’ll love it. It’s really funny and engaging. I second this book. It’s a great read-aloud and a fun story! Plus, vegetarian vampires, c’mon! We are on the last book now, Bunnicula Strikes Again. It has a lot of great references that my daughter is really enjoying. Two dogs discuss how much they love Tofutti. A big plot point occurs around the new vegetarian restaurant in town. And Harold mentions that his human family definitely does not hunt and he also finds it disgusting. Good to know! I’m not sure I’ve read that one.